Person who cranes, stains or otherwise awkwardly turns their head and stares while passing the scene of something interesting (usually morbid in nature). This is usually seen and performed while driving past the scene of an accident, or any other incident where there are police, firemen or ambulances with lots of flashing lights. Belinda Bauer manages to write books that get right under your skin, in this case literally, when Patrick Fort enrols on an anatomy course and along with three fellow students is faced with a cadaver. The object of the exercise is to determine the cause of death of ‘number 19’. Patrick has no interest in becoming a doctor, he wants to know what happens when people die. His interest and obsession with the subject ties into the death of his father when he was a young child and the fact that he suffers with Asperger’s Syndrome. When Patrick’s assertion of the cause of death of ‘number 19’ turns out to be at odds with the official certification he is determined to prove that he is right! This book is not just about Patrick’s quest though. There are scenes set on a hospital high-dependency neurological ward where those either in a coma or recovering from one are nursed disinterestedly by the staff there. Tracey in particular took the job so that she could have a rest away from patients who talked, and read her book series! Tracey sets her sights on Mr Deal with plenty of opportunity to appear kind and caring when he visits his silent wife daily. My précis of this story doesn’t do justice to the narrative that the author weaves around the silent happenings on the ward or Patrick’s original take on the world around him. Patrick’s mother is at home wishing him a ‘normal’ life but with no real optimism that he will find his way in the world and when he finds himself at odds with his lecturers she is powerless to help him. This is one of those books that is full of a cast of unpleasant examples of the human race, which would sometimes put me off a book, but the writing is so compelling as Belinda Bauer manages to sprinkle the text with some fantastic dark observations about life, the characters and the world in general changing the tone from horrid to fascinating. I couldn’t stop reading this book and all the time I wondered how all the strands would be pulled together; of course Belinda Bauer managed this with an elegant bow. She’s such a good writer, and I loved the dark, dark humour in this one. It was a very good read. The dark humour was perfectly pitched. … Great that this post currently has a mention on your sidebar – thank you! 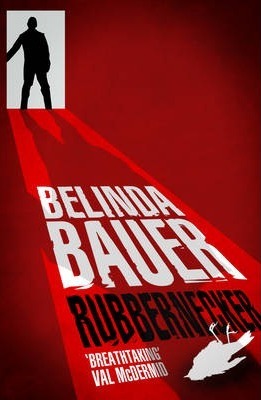 I’ve just read my first Belinda Bauer novel a week or so ago (Badlands, her debut novel) and I definitely want to read more. It’s interesting that she claims she doesn’t intend to start with crime fiction, yet her books always end up on the dark side. Mmm… I have enjoyed all her books although I wasn’t quite so keen on her second book Darkside. I can clearly see this probably didn’t start life as a crime novel but it’s almost as if she couldn’t help herself. Even better as it means it isn’t a ‘straight crime novel’ Happy reading.